It’s no secret Hong Kong loves Japan, so much so that from time to time, small carnivals, and pop-up shops will take place around the city celebrating all things Japanese. 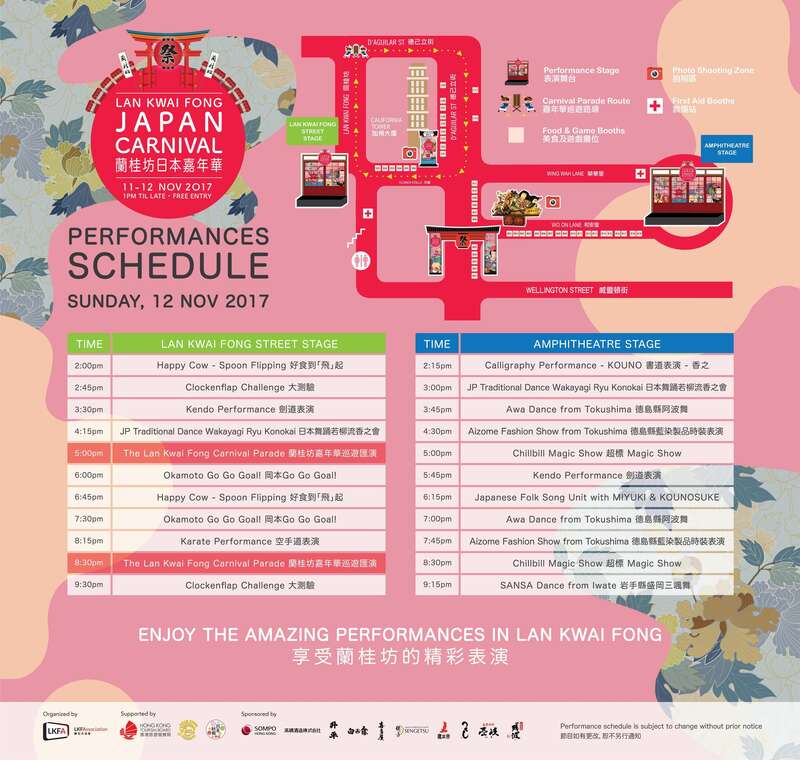 Lan Kwai Fong, who has organised its annual Carnival for 16 consecutive years, brings a little twist this year by debuting the Lan Kwai Fong Japan Carnival, to celebrate the culture and traditions of Japanese cuisine, fashion, music and dance. 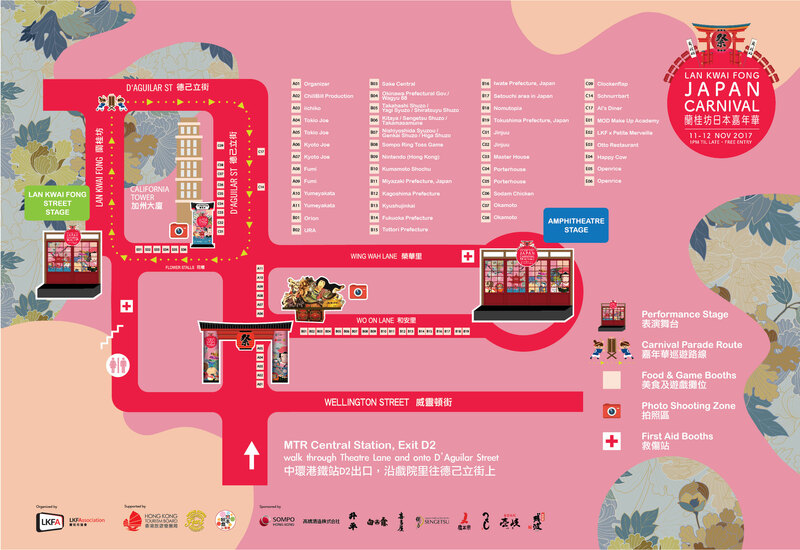 Done in partnership with the Consulate-General of Japan in Hong Kong and the Sake Federation, the two-day carnival will showcase over 40 Japanese sake booths in the authentic style of the traditional Japanese Matsuri for your ultimate consumption and delectation. Stroll around town in a yukata (traditional Japanese clothing) and take photos with family and friends at the Matsuri photo booths that display local landmarks like the giant illuminated lanterns from Aomori Nebuta Matsori. Yumeyakata at booths A10 to 11 offers a free trial experience, find out more here. Head to Okinawa (Orion beer booth at B4) and tuck into Orion Beer battered tulip chicken wings, prawn rolls, takoyaki and chicken skewers with wasabi. Wash it all down with a selection of Orion beer and cocktails. Get your sake education on with Sake Federation’s extensive collection at booths B5 to B7. One of Lan Kwai Fong’s major sponsors this year, the Sake Federation will have experts on the ground to help you find out what your sake preferences are. Get even more sake. At Iwate, booth 16, indulge in a sake and wagyu beef pairing while watching an exciting traditional Japanese dance by SANSA Dance. But don’t dawdle - only 50 servings of Wagyu beef will be provided every hour. Head to Tokushima on the next booth at B19 to discover more traditions from the serene island town. Apart from documentaries showcasing the island, do check out the Awa Dance (above) and the Aizome Fashion Show. We’ve got one thing and one thing only on our minds when it comes to Tottori (booth 15): the Matsuba snow crab. The meaty shellfish is packed with the flavours of the sea and is Tottori’s quintessential winter food. Don’t discard the innards either - they are the perfect accompaniment to sake. Nomutopia is Nomu and Utopia combined and is a Hong Kong-based start-up sake project by sake lovers. Join them at booth B18 to learn more about Nomucation - an education on boutique sakes; Saketabi, a community of travel drinkers who bond at local breweries; and Wushu-pairing, the exploration of sake pairing with international cuisines. Nintendo needs no introduction. Head to booth B9 for Switch promotion and free game trials on site. We’re pretty sure a glass of sake on the side can only increase your gaming skills. If you tire of classic sake and are looking for something with a twist, head to Iichiko at booth A3, who will be offering yuzu, ume and mixed berry flavoured sake and shochu. This is one for the fun ones. And what’s a carnival without booth games? Engage in a round of ring throws at Sompo Hong Kong (booth B8) and try your luck. Each turn comes with five throws within 30 seconds. Try your luck, you may have the chance to win amazing prizes on the spot. Miyuki RINDO, a symbolic Japanese Folk Singer in TOYAMA prefecture in Japan, and a guitarist Kounosuke KOIZUMI will have a Folk Song Funk Session. They will present “Japanese WA Live” with a Shamisen, Japanese traditional plucked string instrument and a guitar for the folk songs, “TOICHINSA BUSHI", “KOKIRIKO BUSHI”, “MUGIYA BUSHI”. In preparation for much anticipated LIVE performance at the upcoming “Lan Kwai Fong Japan Carnival”, last month Kochi Prefecture has especially invited KOL Soko 和泉素行 and some young dancers from EDF Dance Studio to Kochi to learn this traditional Yasakoi Dance. "Yasakoi Naruko Festival" is a very traditional summer festival in Kochi Prefecture of Japan, it is one of the 4 major Shikoku Festival. Festival will take place in parade style, with dancers dressed in colorful costumes and makeup, while holding traditional percussion instrument called Naruko. Nowadays, the festival dance has evolved from the more traditional style to incorporating different styles of dances from around the world, Samba, Rock, Hip Hop, etc.Want to know how much they have picked up from this special training? Find out yourself by coming to enjoy our daily “Lan Kwai Fong Carnival Parade” at 5:00 pm & 8:30 pm. The LKF Japan Carnival runs from November 11 to 12, get there early to make the most of the event! All images are the rights of their respective owners.